this program doesnt track me whether i use orion or the steam client - what cna i do to fix this? 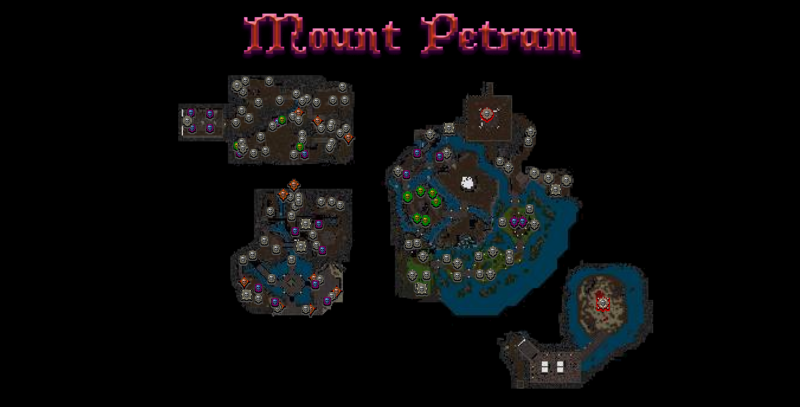 These are the MONSTER SPAWN LOCATIONS for Ultima Mapper! 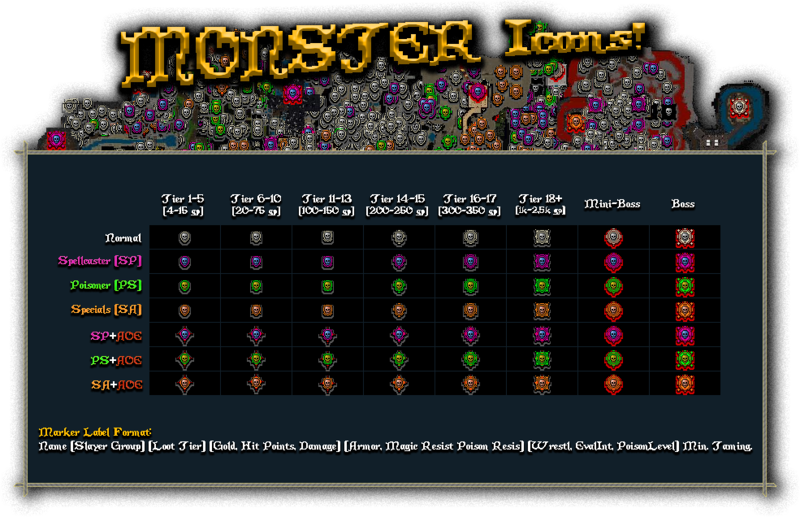 - Every much (give or take one or two) monster spawn location in Dungeons and Overworld are included. - Use it by download the Outlands Marker Pack + Ultima Mapper. Links are in the OP above. - The files used are: Monsters.xml and several .png files which all begin with MOB*.png. The *.xml and all *.png files are needed for it to work. - Icon types are listed in the above image. - The icon priority follows this logic: Poisoner > Spellcaster > Specials. - Poisoner and Spellcaster is determined by wether or not the monster has poisoning or magery skill. - Specials are determined subjectively wether or not the monster has a special ability that significantly contributes to the fight. - AOE is determined wether or not the monster has an AOE ability. - Icons for a TRAP (not shown) is a white skull on black background. - The mouse-over name will display many parameters relating to the monster, including name, slayer group, monster tier, gold dropped, hit points, poison level, minimum taming etc. (Monster tiers and stats are currently not updated, however spawn locations and relative strength should be mostly correct). - 181027: Updated mob locations + added minions + new Mini Bosses. - 180811: Updated all tameables. Added missing areas of Mt. Petram. Added wilderness spawn in snowy area (probably static). - 180726: Final check on all POIs + included a few that were missing. Adjusted Nightstalker to new stats. Added the new mobs in Prevalia Zoo. - 180725: POI:s and all overland spawns added. - 180724: Released initially. 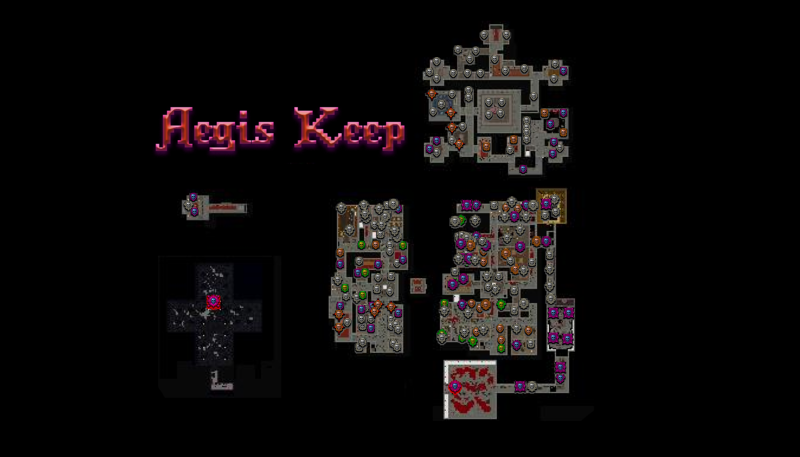 Dungeon spawns included. - Monster tiers and stats are currently not updated! 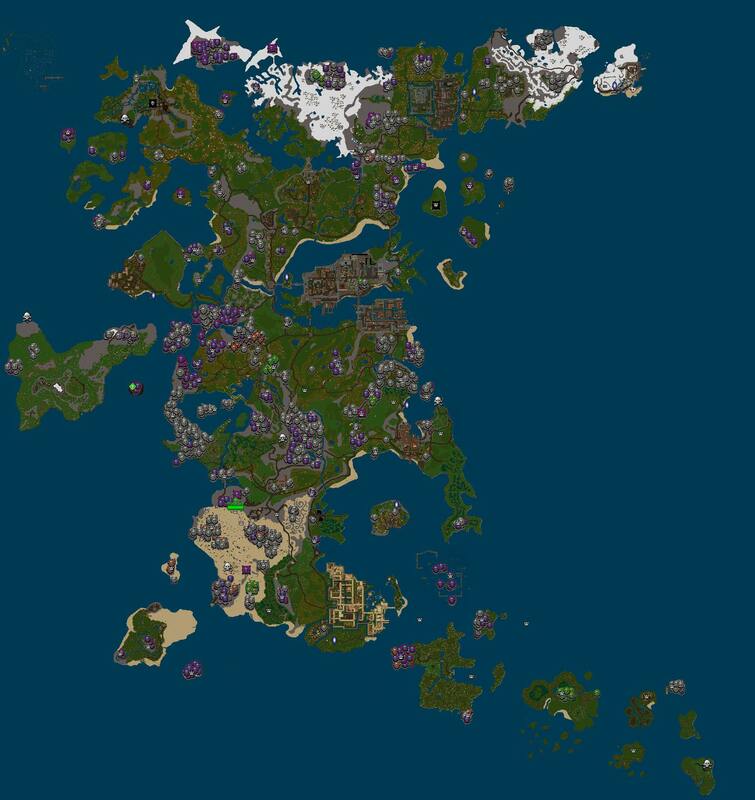 However spawn locations should be mostly correct! -Correctly classify mobs as Special attacks or AOE. - Marking dungeon up/down levels. - Special icons for stealthed mobs and for neutral mobs. This looks awesome! Will there be a way to toggle monster icons on/off? 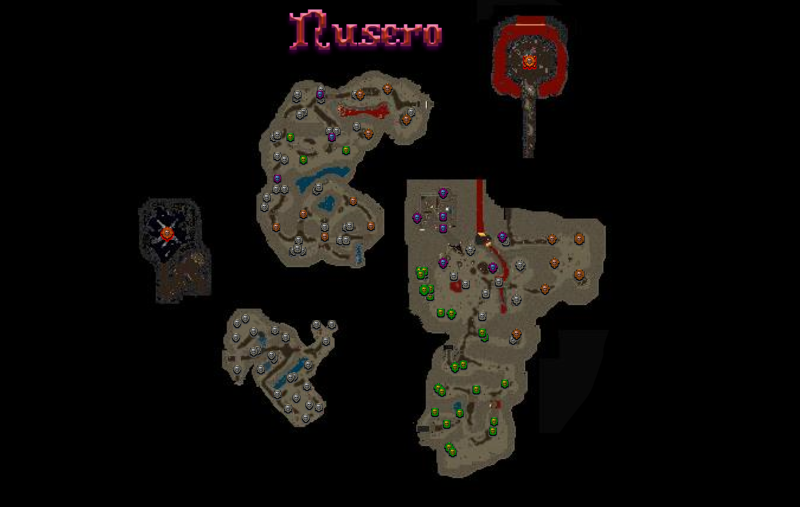 I think “normal” mob icons could clutter the map in certain situations. Yes, you can select which markers to show in the menu of Ultima Mapper, and toggle some to be off if you want. The marker files are basically just *.xml files that contain a name, an icon and a position. If you look in the gitHub, there's Alchemists, Blacksmiths, Moongates etc. This one is called Monsters. Doesn't clutter it up too much anyway, if you have a decent zoom level. The pictures above are pretty zoomed out. Outdoor spawns/Points of Interest are now also included! What remains to be done with them is doublechecking, and I probably also missed a few of the static overland spawn. -> Have now double checked and also added a few that are missing. There are probably not many, if any mob locations missing now. Report them to me if you find them! Such a massive piece of work - amazing, thanks. Black Tea - you sometimes rub people up the wrong way, and I don't agree with all you say, however this is class. Thank you guys, hope you enjoy. Did a final update now on POIs + fixed some stat errors (citrine elemental does not have 600 poison resistance, FYI). Anyway, what I can really use help with is to check special abilties and AOE. This is bascially done by just farming the mobs and seeing what the do. 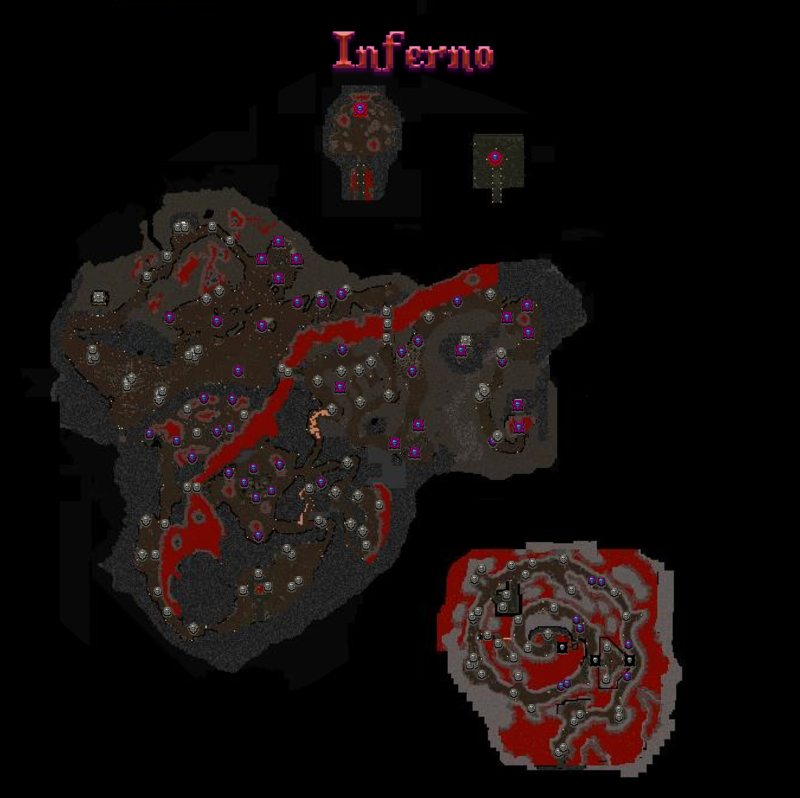 If you do that, I would appreciate if you cover one entire dungeon or one entire set of mobs, to make it easier to work together. - Has to contribute significantly to how hard the fight is. I.e. goblins throwing smoke bombs or wolf hounds charging might not qualify, but a mob dealing bleed attack probably would. Have to be a bit selective here since almost all mobs have some sort of special attack. - Any AOE that deals damage or any AOE that feels like it adds significantly to the fight. Most AOE effects should fit these criteria. A good rule of thumb is, if you didnt even notice the ability or the AOE and barely can tell what it does, it's probably not significant enough to add. Is any mining caves markers? Anyone explain exactly how to get this installed and working with UO:O? I keep getting an error that says the map needs to be updated and to restart the client. Even after a restart I just keep getting that same message. Ask in Discord. Not sure exactly what problem you're running into. It will try to update a lot of times, I think it applies each subsequent patch in sequence rather than as one big dump.